Mitchell has it all. In the opening narration, he says he has “A wife he loves. A decent job.” He’s even got a kid on the way with his supportive wife Sarah (Bridget Fonda). 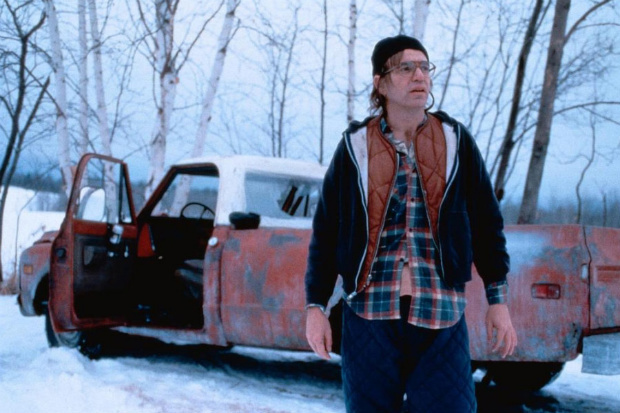 While he works in a feed mill, his older brother Jacob (Billy Bob Thornton) lives a lonely life. He’s a bit dim and very nearsighted (literally, like in he wears thick glasses), but he’s got a decent heart and hopes to rebuild the family farm someday. Jacob’s buddy Lou (Brent Briscoe) is happy to just get through the day and maintaining his buzz. On Christmas Eve, the three men come across a crashed airplane buried in the snow on a nature preserve. Along with the plane is a corpse and $4 million. Hank is hesitant to keep the cash. Jacob and Lou think it would be stupid not to. They come up with the titular plan to hide the money until spring, when the plane will surely be discovered. Then they’ll divide it amongst themselves then hightail it outta town. “I bet it’s drug money,” Lou gambles. They’ll be hurting no one by taking it. Hell, it’s not even stealing. It’s “found money’ they tell themselves. Now if they could all just keep their mouths shut. Their greed and reckless impulses (sometimes homicidal) snowball the film into real human horrors the characters would never have contemplated in the beginning. The ascending calamities grip the audience in a way few thrillers do, thanks in part to Raimi’s control behind the camera and the strong performances across the board. It’s rare too that characters act so goddamn human in a film like this, where tragedy is oftentimes brushed off to set the next scene. The weight of their actions becomes very real for all three men and the moral implications lead them to do progressively more despicable acts. Paxton brings a palpably human side to the story. All of the actors do, in fact. A character like Jacob would easily have been a dimwitted burden, a Lennie Small character. Billy Bob makes him a genuinely tragic figure. A guy who knew the girls were teasing him in high school, but embraced the attention. He delivers three honest-to-god heart wrenching dialogues in this film. If anyone ever questions Billy Bob’s talent as an actor (though at this point I don’t see how that’s possible), watch him play Jacob in A Simple Plan. I didn’t know much about this film going in, but I’m really thrilled i checked it out. It’s portrayal of real human crimes in an unsensational manner is poignant and harrowing. All of the actors are a joy to watch and the paths A Simple Plan maneuvers them down are morally rocky and turbulent. It’s streaming at the moment on Netflix – if you’ve never seen it, seriously make time for it if you dig a solid crime drama with strongly human characters.